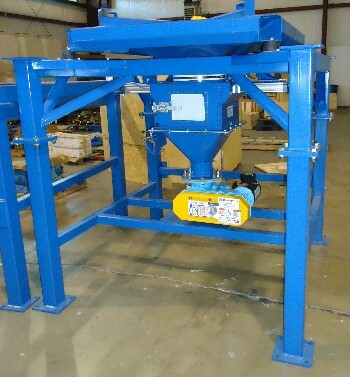 Carolina Conveying’s Bulk Bag Discharge Stations feature Heavy Duty Design, Modular Construction, Operator Safety and Numerous Design Features covering a wide range of application requirements. 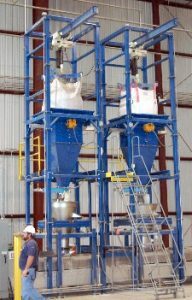 The operator must never be under a suspended load per OSHA regulations, otherwise there is a hazard of being crushed. Bulk bag warning labels advise to keep clear of filled, unsupported bags. To meet these requirements, a bag must be supported from below. 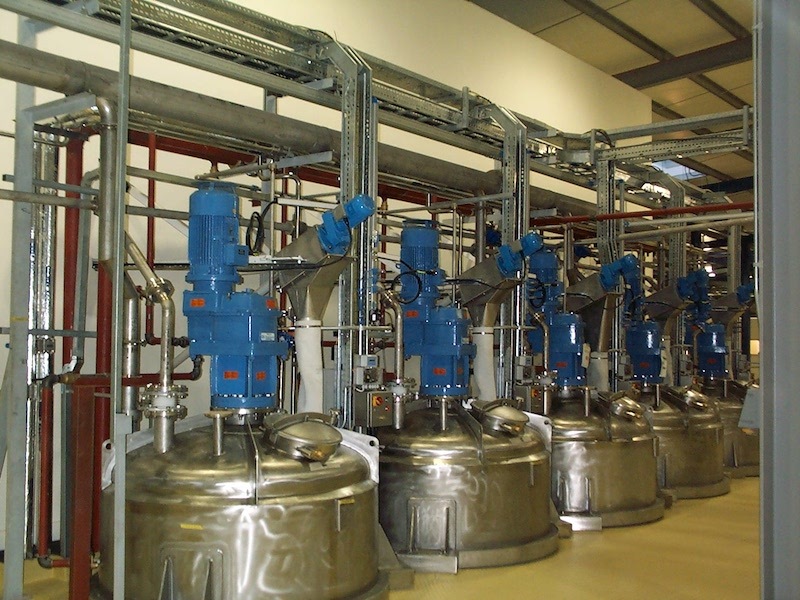 Carolina Conveying offers Full Platform Support, assuring optimum operator safety. 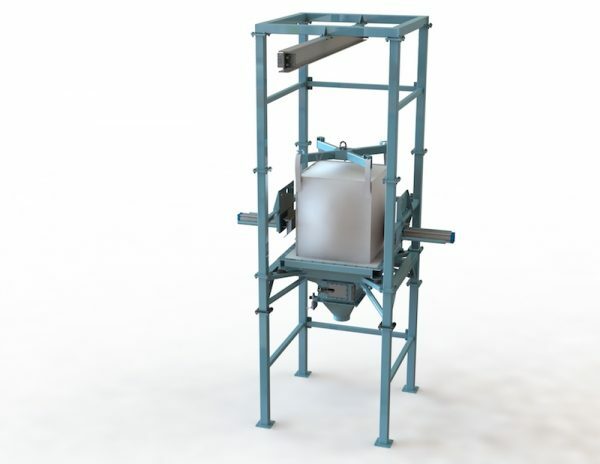 The main support frame is constructed of 4 inch tubular, structural steel. 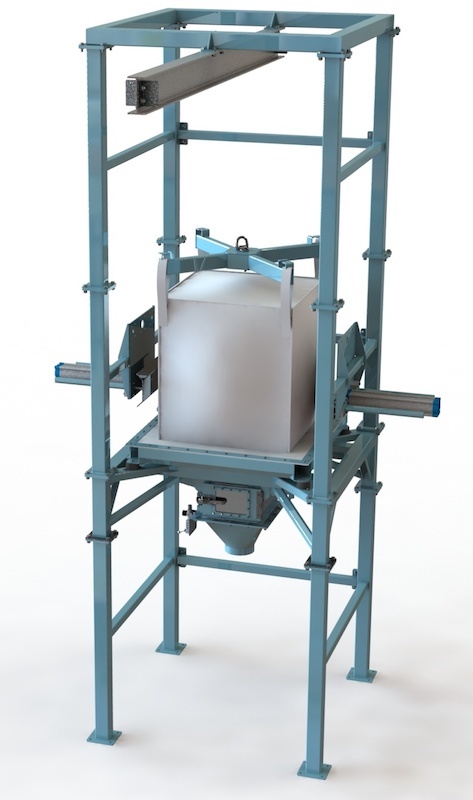 This heavy duty design insures that the station will not sway when loaded with even the heaviest bags. 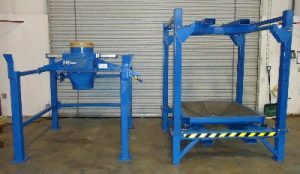 Modular construction allows for easy of assembly and the addition of other equipment options. 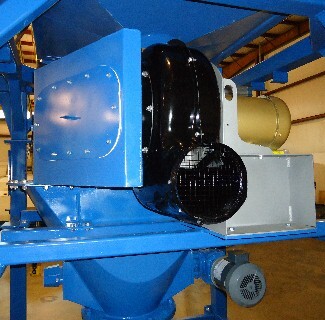 Dust control is accomplished in several ways with the Carolina Conveying Bulk Bag Station. 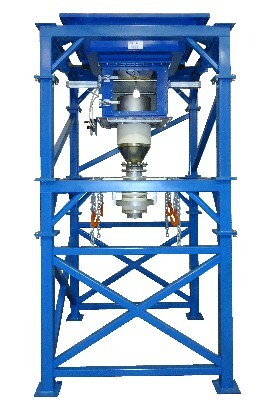 First, product is contained with the full platform support dish. 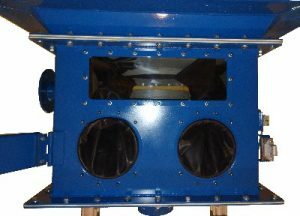 As the bottom of the bag rests on the pan, the bag seals off product to the discharge chute below. 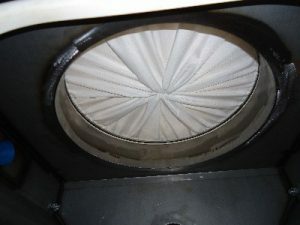 Any material that falls into the dish discharges with the rest of the product, not onto the floor. 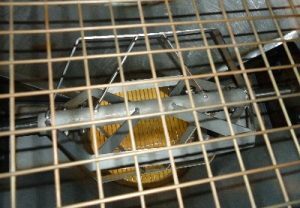 The access module below the dish allows the operator to untie the bag in a safe, dust free environment. Pinch bars inside the access module insure that product does not flow until you are ready for it. 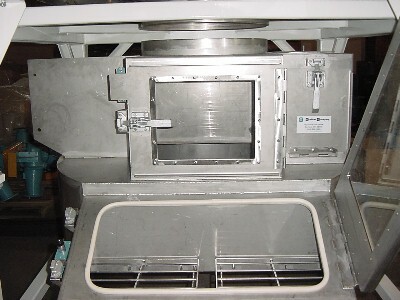 A dust extraction port at the back of the unit pulls away any dust between bag changes. 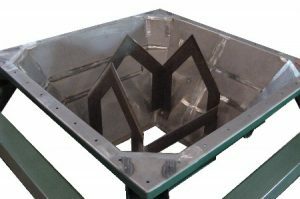 A dust collection ring is also available for the top of the bag support dish. 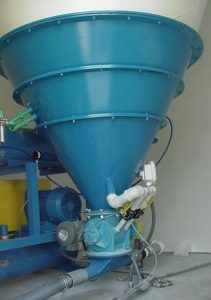 Product discharge is often difficult from bulk bags due to compaction during storage and transport. 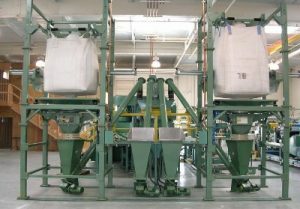 Bag shape is also not conducive to product flow, as most products do not readily flow out of a flat bottom container. The small outlet on most bulk bags also creates a bottleneck. The most effective means of discharging product from bulk bags is with massage paddles. Massage paddles break up compacted bags. 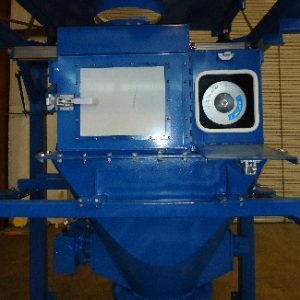 They also push material into the critical flow path, which is over the bag outlet. This is accomplished with our bag massage paddles. Each paddle also has two guide rods, which eliminates twisting, bending or breaking. 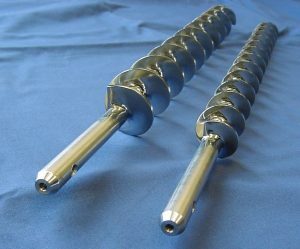 Pinch bars allow dust control and flow control. 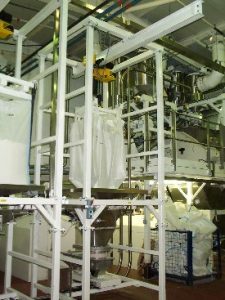 After the bag is loaded into the discharge station, the spout is pulled down into the access module. The pinch bars are then closed. The operator then unties the bag spout and closes the access door. 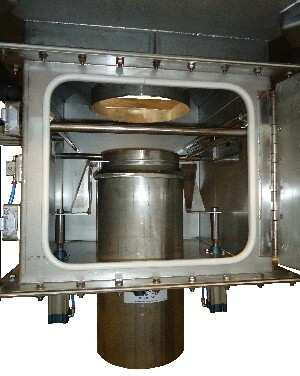 The pinch bars are then opened, allowing product to flow. 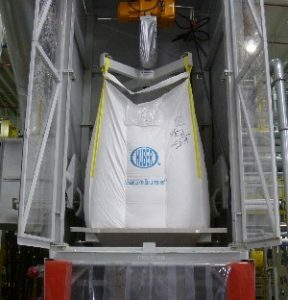 This allows the bag to be untied without exposing the operator to product. 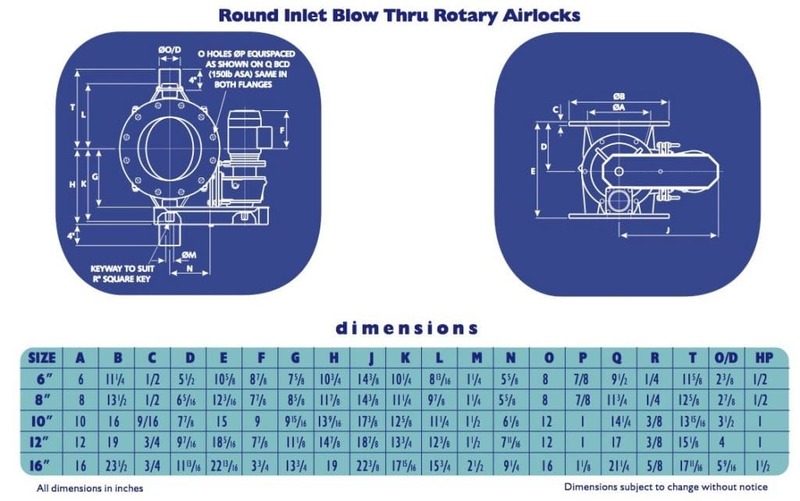 Product flow can be stopped at any time by closing the pinch bars. Partial empty bags can be retied shut and removed from the station. 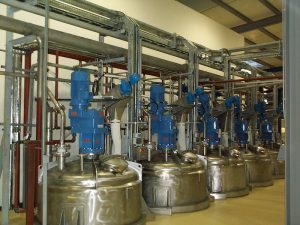 Iris valves operate similar to the pinch bars, with the added benefit of certain amount of flow control with free flowing products. The valve can be partially opened, restricting the bag outlet spout. 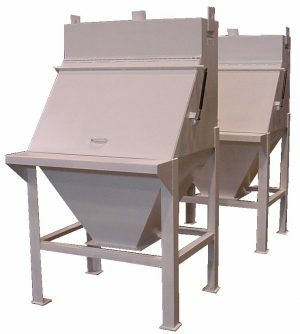 Carolina Conveying offers an optional bag outlet spout clamp for their bulk bag discharge stations. 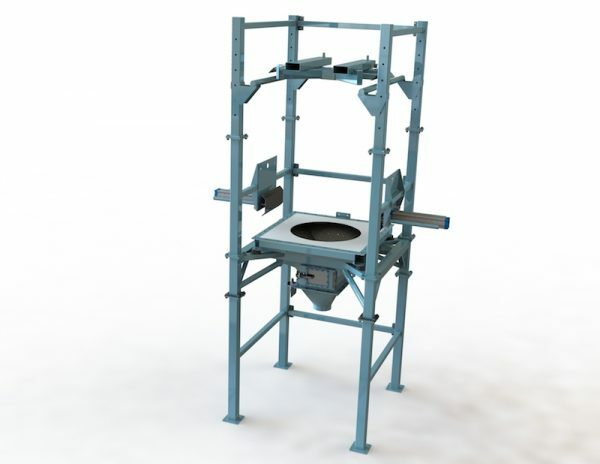 The outlet spout clamp is useful for applications where minimal operator dust exposure is required, or in sanitary applications where product cannot come into contact with the outer bag. The outlet spout clamp consists of a feed tube and clamp ring, which is either pneumatic or manually operated. 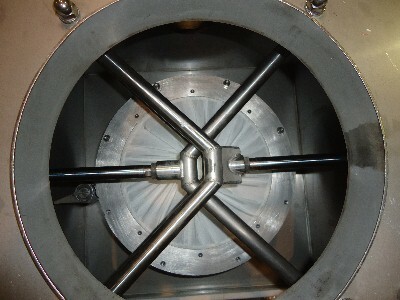 The bag outlet spout is pulled down through the clamp ring and then over the OD of the feed tube. If the bag has a liner, then it is stuffed down inside the feed tube. 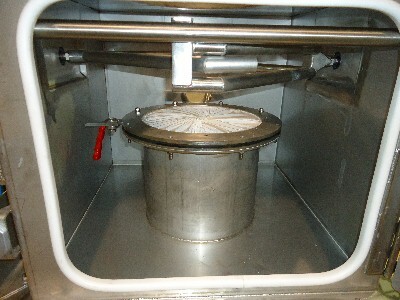 With the bag spout in place, the clamp ring is pulled down tight to the feed tube. 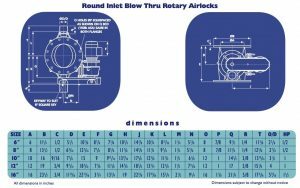 A gasket on the underside of the clamp insures a good seal. 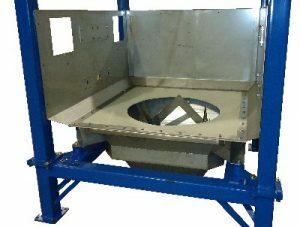 Note that unlike some of our competitors, the clamp ring is still totally enclosed in our access module insuring that any accidental spills are contained. 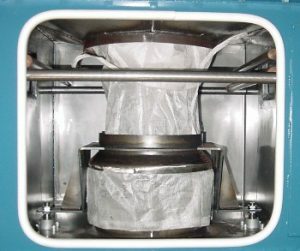 An optional bag deflator pulls out all dust-laden air from the bag once it is empty, deflating the bag at the same time for easier disposal. Knives are used for single trip bags that do not have an outlet spout, or for quick discharge of bags that are going to be disposed. The knives are located in the bag support dish, and slice open a large section of the bag bottom as it is lowered down into the station. Glove boxes allow the operator to manipulate the bag outlet spout with minimal risk of dust exposure. Allows the dumping of 50 pound bags into the same process stream as the bulk bag. 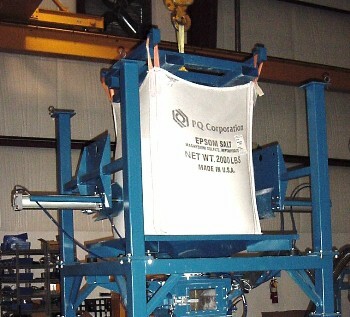 The bulk bag is loaded onto the upper framework resting on the floor. The upper framework and bag are then raised and set on the lower framework. Perfect for spaces with limited headroom. Dust collection is built directly into the access module, such that any dust collected still drops into the process. 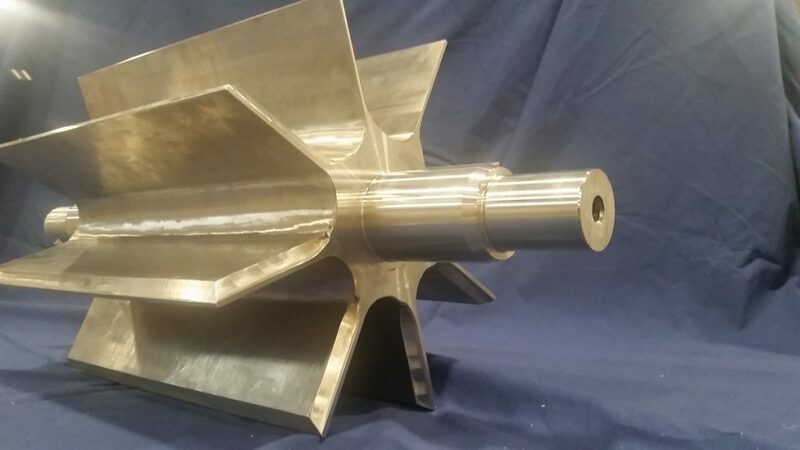 A series of rotating blades keeps product from bridging and breaks up large clumps. Integral I-Beams with Hoist & Trolleys or Simple Fork Lift Loaded Stations.